Note: Updated in 2019 for clarity and additional resources. I know what it feels like to have a big dream. To have a vision of something awesome, something you feel called to do. Fifteen years ago I felt called to be a teacher. To lead, to heal and make an impact on the world. There was just one snag: I didn’t know how to turn my dreams into a reality. But my desire and willingness were enough to clear the path. One day at a time I healed my fearful perceptions, deepened my spiritual practice, strengthened my faith and took small right actions toward my dreams. So today let’s talk about that: how to go from idea to action. How can we turn these ideas we’ve been dreaming of and meditating on, the ideas we feel passionate about, talk about with our friends at brunch, into actionable steps? I want to give you 3 steps that worked for me. Watch the video for these steps, and keep reading to see them outlined. Step 1 is to think it. You have to be able to think openly and positively about your vision. Think the thoughts of the highest good for that vision. In your daily life, think your way into what you want to create. Be conscious of your thoughts. Consciously think about your dream in positive ways. Your thoughts are very powerful because they affect how you feel. And that’s Step 2. To be on your dream career path? To do the work in the world you’ve been longing to bring forth? To spread an empowering message? The way to feel it is through meditation. This is a really simple practice that feels great! For two or three minutes a day, sit in meditation and let yourself cultivate the feeling of what it is you desire. This is such a game-changing practice. I’ve had so many experiences in life where I’ve allowed myself to dwell in the feeling of service, or that excitement of being on stage or sitting next to Oprah doing an interview. Those emotional feelings that came forth in my meditations were manifested in my life, so take your thoughts and feelings very seriously. Step 3 is to begin to take action from a place of spiritual alignment. Many of us, when we have big dreams, take action from a place of ego. We think, “I’ve got to make this happen! I gotta hustle, I need to force this to happen.” Or the opposite happens. The ego keeps us playing small by asking, “Who are you to do this?” And we never do anything. When you sync up with the Universe, you feel a confidence that you may not be able to access with your logical mind. When you practice the first 2 steps, you sync up with the Universe. And you feel a level of confidence that you may not be able to access with your logical mind, because it’s a result of your spiritual connection. You’re also better equipped to notice when you’re acting from a place of ego, and you can realign with spirit. These 3 steps are the first crucial ones you can take on the path to do what you’ve been dreaming of. If you’re ready to get really clear on your vision and seize on your dreams, get on the waitlist for the Spirit Junkie Masterclass Digital Course! 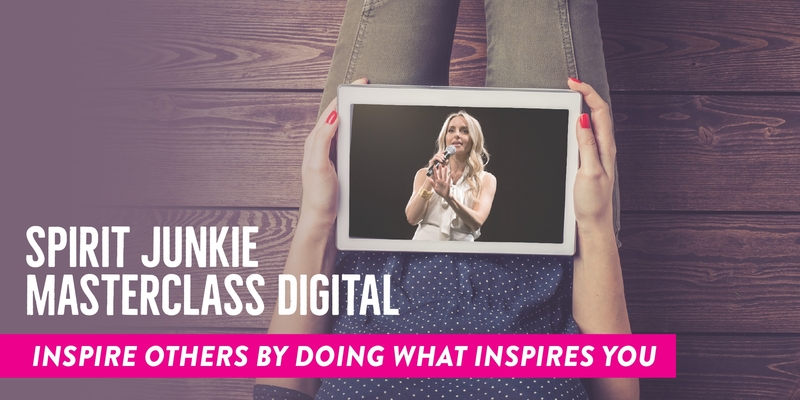 The Spirit Junkie Masterclass Digital Course helps you gain the confidence and business-building tools you need to live your highest purpose, make an impact and earn for your great work. If you’re ready to say yes to that voice that’s been calling you to wake up and go do that great work you’re here to do in the world, then this training is for you. Enrollment opens in June 2019. Be the first to know when it does. Get on the waitlist now! I quit my job on Friday and am full-on leap of faith freelancing in a month. Everything you are saying is in perfect timing for me right now. I want to set my business up and plant seeds from a place of spiritual alignment rather than ego. Thank you! amazing. so psyched it served you! go sister go! YES! Go Jen! I too am getting ready to quit my job and make a go of my dreams. Much love and success to you! I watched the webinar yesterday but this serves me as a spark to ignite my action steps.I received some new insight this morning.Thank You! Where is the link for the webinar? Thanks! The message is strong i love the the three pointer break down it really resonates my feeling lately. I am so called for this. I have felt pulled to spirituality my entire life and I fought against it due to fear. I want to take the masterclass so badly but as a college student with a broken car and only a part part-time job. I just can’t pull off even the $349 per month. I think that what you are doing here is amazing and I hope that one day I will be able to take your masterclass because it is literally everything I have been looking for. Revisit the chapter on asking for signs. Begin taking action as outlined in this video and blog and ask the Universe for signs that you’re on the right track. Pay close attention to that chapter and trust in the signs you receive. Signs from the Universe will be crystal clear. There will be no denying them. 🙂 You can also communicate with your spirit guides. Absolutely love your content, I have two young children so I don’t quite have the time to give to a master class right now, it is on my to do list however! In the mean time I’m thoroughly enjoying the other resources you have available on your website and that you send through to my email box. I received an email at the beginning of June with a three part video training detailing how to take action. I had started watching it but then we were away on holidays, I went yo revisit it today and the link doesn’t appear to be working. Is there any possible way to view these? They looked amazing.